Growing a variety of crops in different places could reduce the risks of extreme weather for our food supply. Drought and extreme weather can destroy crops, putting food supplies in jeopardy. So as climate change makes farming riskier, we may need to change what, where, and how we farm. 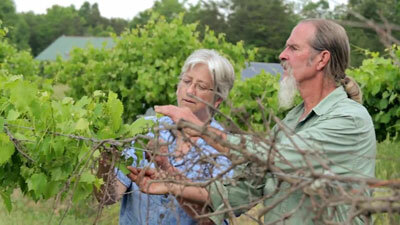 Lengnick and North Carolina farmer Ken Dawson examine a planting of muscadine grapes. That’s researcher Laura Lengnick who owns a climate risk management consulting firm. She recommends growing diverse types of food across the country. Then if crops in one region fail, we may get the same products from another area. And varying what’s grown within a region or farm can also help. Pests, moisture, and temperature changes can affect different crops in different ways. So a bad year for corn could be a good year for something else. So diversification may be key to keeping the world’s food supply stable as the climate changes. Photo: Courtesy of Climate Listening Project.